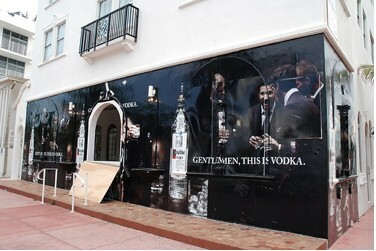 One of our readers found this illegal Pearl Media streetscape down in Miami Florida. He did a bit of research and found this company actually operates out of New York. Just like our old favorite, InWindow, Pearl Media seems to operate illegally as well. The fact of the matter is putting up advertising in empty storefronts is to temporary and fleeting to go through the laborious permitting process. By the time permits are acquired a storefront will have long been rented, making this business model impossible to run legally. The fact that businesses like Pearl Media, InWindow, or Application Unlimited exist at all highlights our cities' lack of enforcement as well as the disregard of outdoor advertising in general. I attached the reader’s email and images below. Thanks again. I've never written you before, but I saw this on Miami Beach this weekend and thought you would enjoy it. 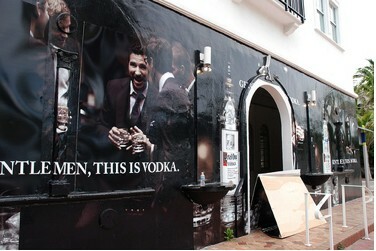 It is a vinyl wrap on a vacant building down there for Ketel One. There was a citation for it already, but the city flat out told me that it was a company out of NYC called Pearl Media and they were already serving them court papers, good news. I also googled them, and found their website. http://www.pearlmediaus.com/ Anyways, since it had fallen down I thought it was a good picture opportunity.